Fifty-one percent of U.S. adults, or 61% of internet users, bank online. 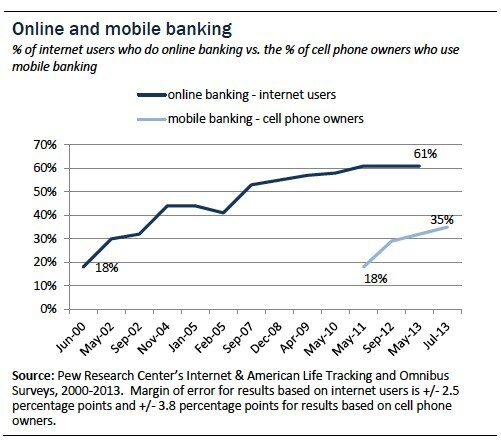 Thirty-two percent of U.S. adults, or 35% of cell phone owners, bank using their mobile phones. Both types of digital banking are on the rise. 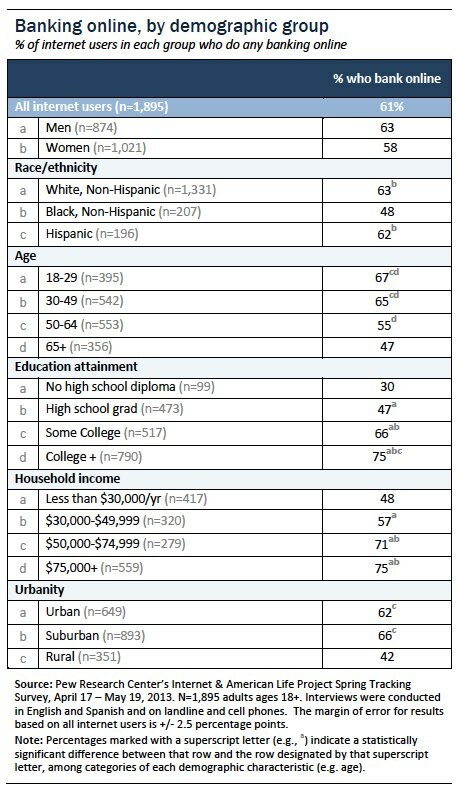 In 2010, 46% of U.S. adults, or 58% of internet users, said they bank online. In 2011, 18% of cell phone owners said they have used their phone to check their balance or transact business with a bank. 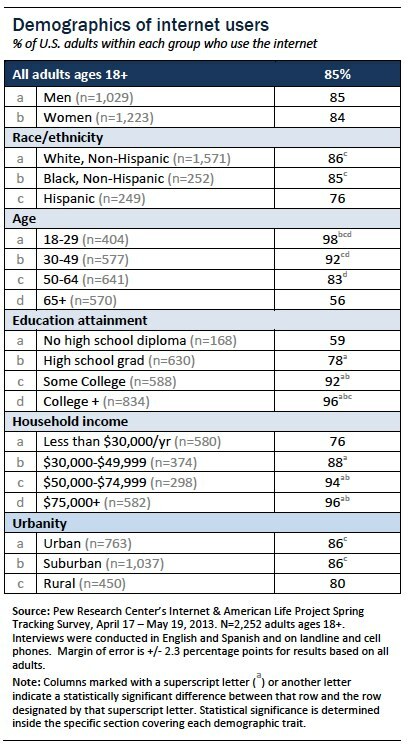 It is worth noting that 85% of U.S. adults say they use the internet, but someone’s likelihood to have access declines with age. Because of the gaps in access among age groups, differences among those who bank online are more pronounced. For example, since only 56% of U.S. adults age 65 and older have access to the internet, the percentage of that age group who bank online is just 26%. Ninety-one percent of U.S. adults say they own a cell phone. Of those, 35% transact business with a bank using a cell phone. 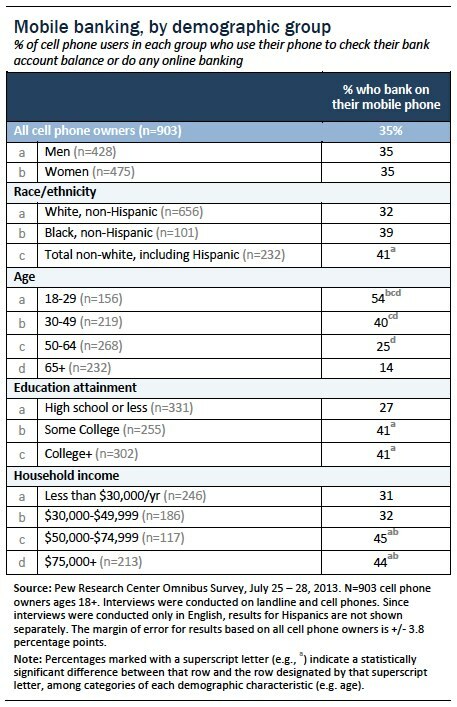 Young adults (ages 18-29) and whites report the most significant increases for online banking. In 2010, 55% of 18-29 year-olds said they banked online; in 2013, 66% of that group did so. In 2010, 47% of whites said they banked online; in 2013, 54% of that group did so. Younger adults are also leading the mobile banking trend. However, in contrast with online banking trends, non-white cell phone owners are more likely than whites to engage in mobile banking.